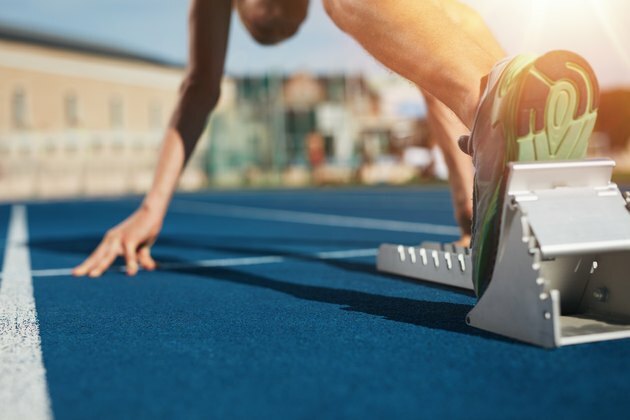 To be a successful 400-meter runner, one must have the speed to sprint, while also maintaining the endurance to hold a fast pace for a longer period of time. Because weight training increases power output — necessary in speed training — weight training is imperative for 400-meter athletes to increase their strength and overall speed. A stronger sprinter is a faster sprinter. According to a study in the Journal of Experimental Biology, runners who excel at shorter distances, whether the 100-meter or 400-meter distance, had more muscle mass than others. Additionally, the runners with the most muscle mass excelled in the sprints (100 meter, 200 meter and 400 meter) vs. long-distance runners. According to USA Track & Field, the governing body for track and field, 400-meter runners should focus on strength training, both in and out of season. Tudor Bompa, the creator of periodization training believes that strength training will help develop an athletes power endurance and muscular endurance if the exercise or race is performed in less than a minute. In the case of 400-meter runners, muscular endurance is extremely important. Squats can be performed with or without weight, but 400-meter runners should increase their overall strength with weighted squats. Poliquin believes that running speed is influenced by the amount of force and power an athlete places into the ground. Start with a barbell on your back and your feet shoulder-width distance apart. With a proud chest, send the glutes back as you squat down, remembering to keep your knees pushing outwards. Drive against the ground as you raise back up to standing. According to Poliquin, those who increased their maximal squat by an average of 30 kilos (66 pounds) also saw an increase in their sprinting speed by 6 percent to 7.6 percent. Power cleans are an important part of any strength training program. This Olympic lift builds explosive strength and speed. Start with the barbell at shin height with your hands a little wider than hip distance apart. With a strong core and proud chest, lift the barbell off of the ground and shrug the barbell up as you drop underneath the barbell and receive the barbell across your chest in a quarter squat. Return to standing and repeat. A power speed sled (not your traditional snow sled) is a fantastic way to build power, speed, and strength all at the same time. Place weight on the sled and push the sled as fast as possible. Another option for push sleds is to add more weight and push the sled at a slower pace. Sleds train acceleration and should not be longer than 20 meters. This exercise works the glutes, hip extension, and knee flexion functions of the hamstrings, and even the calves. With the posterior load of sprinting, the glute-ham raise will train the muscles required to perform the 400-meter dash. Step into a glute-hamstring machine and lay down with your body parallel to the ground facing towards the ground. Hook your feet into the foot holder, squeeze your glutes and raise your legs up towards the sky. Lower down with control and repeat. A fast sprinter will have a strong upper body because it acceleration, a key factor in a 400-meter race, requires upper body speed and strength. Chin-ups can be performed with bodyweight or with additional weight added to make it more difficult. Hop up on a pull-up bar and place your palms facing towards your body. Engage your core and pull your chin up over the bar and slowly lower yourself down.